Babies, balls, brass, broadband and building. I've been meaning to do this every night for the past three weeks... well, here it is! 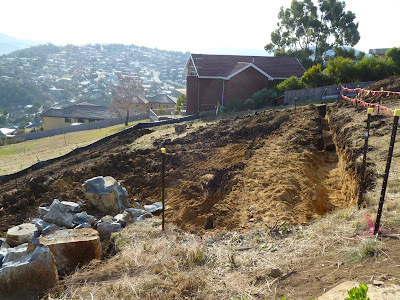 This is the view from the front-right (south east) of the house - the last one was taken on July 21! A lot of bluestone boulders but nothing that couldn't be dealt with, fortunately! Again the last picture here was July 21. Notice the house seems to take up the whole block? Well, not really - the flat section in the last picture (just right of middle, below the house with the red roof) is where the water tank will be - under the rear deck - so the house will end just to the left of this. The excavation work to the right is all related to the deck and levelling of the backyard. All the timber which you see is only temporary - to support the construction of the giant wall. The wall will run alongside the edge of the driveway, along the edge of the ground floor of the house. At the back it will surround the water tank (enclosing it, almost - there will be a small entryway) and then run partially into the backyard - enabling us to terrace it into multiple flat sections. This is our driveway - with 7 1/2 month pregnant Emma - and the view! That's it for now - hopefully future updates will be more frequent that every 3 weeks! This entry was posted on October 4, 2009 at 12:14 pm, and is filed under building, driveway, excavation, house . Follow any responses to this post through RSS. You can leave a response, or trackback from your own site. House update - slab and building upwards! Michael McGuire: AFL’s a world-class spectacle, but why is world validation of such importance? Somehow he made it to 5!